India’s Slum population is expected to surge to 104 million (9% of the national population) by 2017*. As the nation’s disparity between the rich and poor deepens, the number of people living below poverty line (<1$ per day) has doubled over the last decade. Chennai city’s Nochikuppam slum is home to 5,000 fishermen families living in less than 1,500 shanties making it the third largest slum dwelling amongst the Indian metropolises. The rise of city’s squatters over the past decade indicated the struggle to cope with rapid urbanisation and the lack of political will, resulting in the failure of the government to regularise and successfully build resettlement tenements. The government’s only indirect response to such slums has been the construction of large-scale resettlement colonies on the outskirts of the city rather than recognising improving residents’ access to services. Pragmatically, building adequate amounts of resettlement housing to house all slum-dwellers will simply take too long, require vast amounts of land and cost the city 1 billion rupees. Moreover, many residents do not necessarily desire such housing: reports indicate that nearly 20 % of allotted homes are vacant and 50 per cent of the original beneficiaries are no longer living in them, subletting them instead. Clearly, this was due to the fact that slum dwellers were transplanted 30 kms away from city centre where they found no jobs and no social infrastructure and thus were forced to move back to the city. A far more reasonable strategy would be to implement the Tamil Nadu Slum Clearance Act (1971) in the spirit that it was written, and start to recognise slums and improve them in situ. The sky-high rentals in Chennai’s downtown and the fight for survival in India’s slums such as Nochikuppam are increasingly blurring the lines between centre and periphery. Urban planners face escalating challenges as these slums will mostly proliferate in semi-rural and downtown areas, a consequence of scarcity of urban land and accelerating rural to urban shift across the nation. Unrecognised slums have effectively become akin to an invisible Chennai, largely ignored by the service provision agencies. As urban planners and architects we must make a conscious decision to improve the quality of life of squatters (shelter, services & livelihood) by applying principles of sustainable urbanism. The need of the hour is a reimagination of the existing land parcels, growth and infrastructural burden squatters place on the city’s civic supplies. 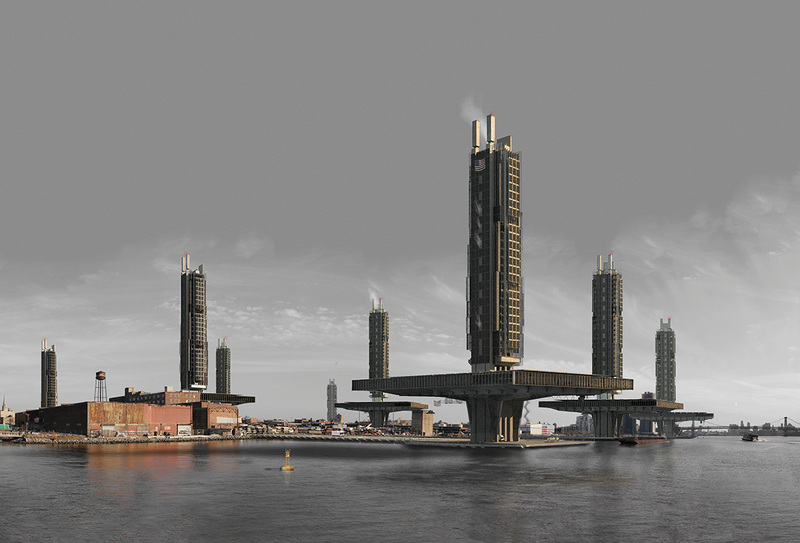 This begs the question – Will the cities of the future be filled with vertical slums? Informal settlements and the paucity of land parcels can no longer be ignored & the complexities of resettlement will force slum dwellers themselves to build higher using locally available, structurally sound, recyclable materials accommodating themselves into organised communities. For the last few years mankind has accumulated more knowledge than in all its previous history. 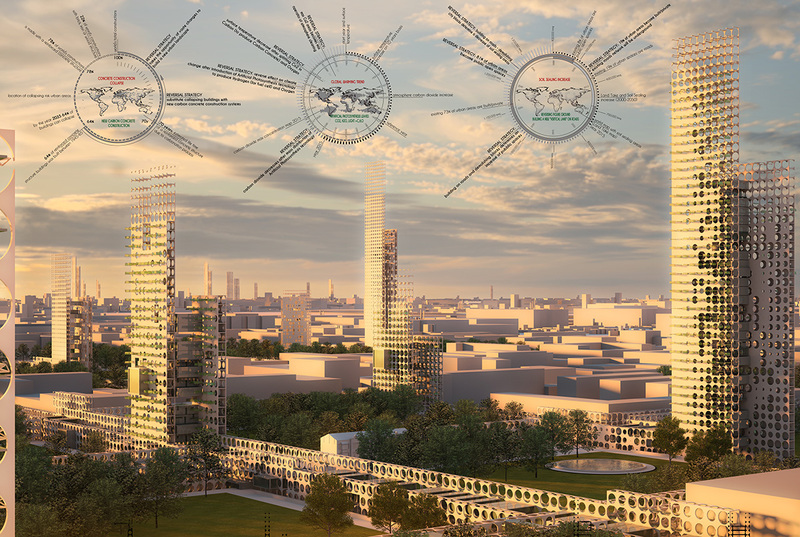 This factor enables us to say that in the next few decades there will be fundamental breakthroughs in science and engineering which will result in changing society and the architectural design of cities. The degree of its influence could be compared to the age of Great Geographical discoveries. 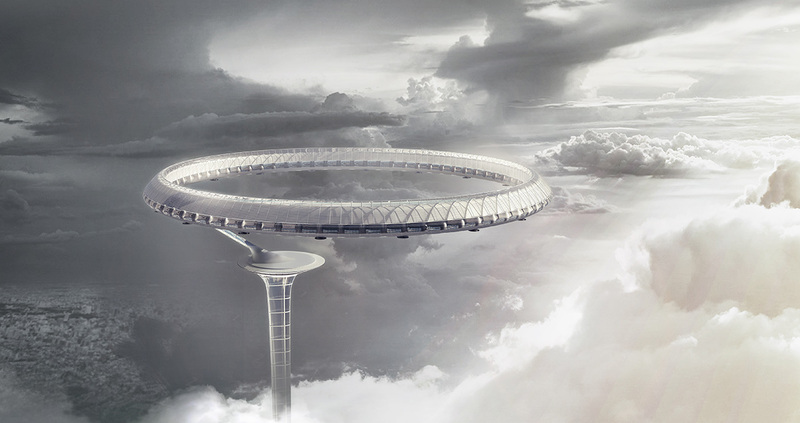 A complex space structure of the future megapolis combines the physical and digital worlds. Spaces of these digital areas have a large number of physical and mechanical laws alien to real space. An ability to fly over or move from one planet to another one, to pass through the walls during system bugs makes the city more complicated. Cyberspace full of hallucination and bugs, components of its own habitat has moved into a real megapolis which is being formed and organized simultaneously in the digital and physical space. “Tomorrow” we expect a completely different topography of the city. It will be a map which includes cyber worlds with intrinsic geography, laws of physics, qualities and even its own residents. It is as though landscapes of computer games have woven into the city space becoming its integral part. 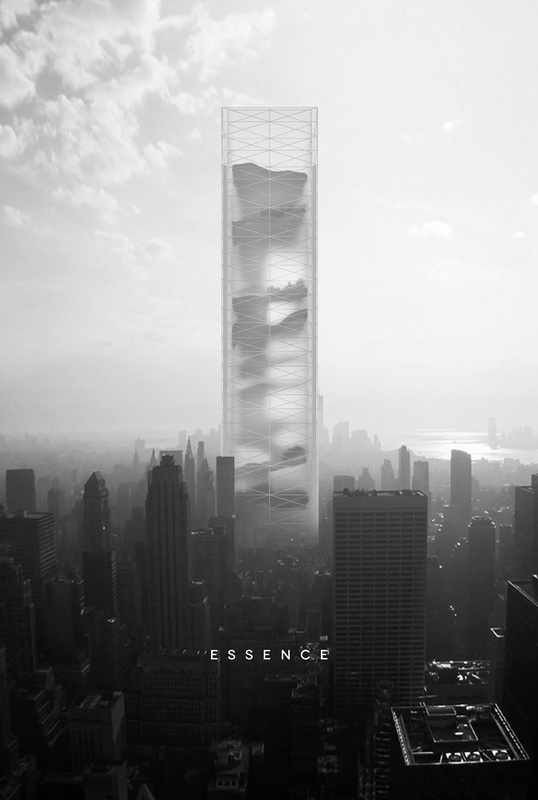 The spatial structure of a skyscraper is also flexible and mobile. All complex is formed round frame structure on which cranes move, completing and moving whole blocks of a complex. The part of frame structure can be sorted at once after completion of the region of a housing estate or intentionally to remain invested with a framework for potential possibility of further transformation and change in the future. The whole completed regions of a housing estate can move to the separate sector that “not to disturb” and “not to constrain” further building or to be interspersed directly in frame structure for transformation of a program palette or its intended consolidation. Huge ships that at once become part of this block of the skyscraper, its organic communication and spatial cell. Its decks are temporary squares of the city, and construction woods of its street. On them inhabitants move. Having sated, the ship “sails” in the next swimming, and on arrival in the new port city, not become dusty indefinitely in megalopolis port, and joins new structure, as the spatial block. Main decks of the ships are covered with numerous weaving installations, reaching top level immigrant-workers start weaving goods for the city. Other ships serve as suppliers of a material for housing that is constructed here. It is a new format of the city street, new public space in a superdense and dynamic urban environment. Limestone hills that are mined are doomed to suffer total annihilation, or become remnance of a souless terrain. This design approach seeks to intervene the process of mining, turning it into a mere “site clearance and earthwork” phase to allow buildings to be erected within, adapting to the sophisticated and ever so beautiful terrain of the karsk topography. These towering natural monuments withstood the tests of time, until humans begin to mine their substances. Mining of these substances not only creates an eye sore, it also increases calamities such as flash floods and landslides. Therefore, it is vital that proper treatment has to be applied upon mining of the natural resources. Limestone materials have numerous uses: mainly as building materials, as aggregate for the base of roads, as white pigment or filler in products such as toothpaste or paints, and as a chemical feedstock. 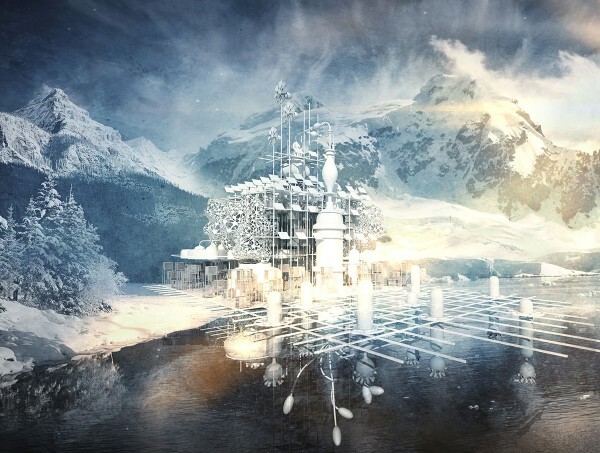 This in turn, creates a building within a mountain, harnessing the natural resources of existing stones and minerals on site to be used as the construction materials eg. marble, travertine. Because of facing threat from alternation of the natural growth pattern, deterioration of the global environment and excessive harvesting of the living creatures, more and more species of animals and plants are now endangered on the Earth. How to maintain species diversity has become a crucial issue. Endless reports of deforestation, city sandstorms, unpredictable death of elephants and brutal hunting of whales keep coming into the public eyes, while human beings are focusing on constructing their survival fortress and exploring potential habitat outer space. However, could we slow down the pace and ensure our future generations could have the same experience about this blue planet, and even the blue sky before industrial era? Before rehabilitating successfully the livable environment and climate, or finding out artificial reproduction methods of all species, human have to build up a Noah’s ark, which guarantees the provision of three elements of life: sunlight, ] air and water. Meanwhile, enough soil and food are essential for growth and reproduction. According to the IUCN Red List of Threatened Species, species are classified into nine groups: extinct, extinct in the wild, critically endangered, endangered, vulnerable, near threatened, least concern, data deficient, not evaluated. Nowadays, there is growing problem in global climate. Studies on atmosphere components provide possibilities for people to learn the law of climate changing. However, detected datum don’t include all the components of the atmosphere. We hope in this memorial building, it can get atmosphere samples automatically every year, and store the samples with reasonable system. With time passing, the building will become a library to study atmosphere components changing with the most resources. In the meantime, future techniques will allow more thoroughly studying atmosphere, providing better ways to respond to climate change. Since the industrial revolution, with more fuel use, more biomass burning, more motor vehicle exhaust, the concentration and distribution of both regional and global atmosphere have changed observably. And that leads to problems like global warming, ozone depletion, acid deposition, air quality going down and so on, which have much effect on earth environment and ecosystems, and put huge threat to human development. Therefore, the observation and study of atmosphere components is quite important. Carrying on long-term steady observation of atmosphere components and its relevant qualities is essential for learning atmosphere components and its changing process. Such based studies on atmosphere components changing law, and responding to climate change and disasters, is one of the essential issues of achieving the unity of man and nature both nowadays and in the future. It’s not enough for studies on atmosphere components to only rely on clearly recording and studying datum. Earth atmosphere components are really complex, including solidities, fluids, and gas, with complicated physicochemical properties. There are limited datum from detecting existing air samples. And there is possibility that some unknown substances make much difference during climate changing process but could not be detected for now. Therefore, air samples are the most comprehensive data resources. Today’s scientific researches often need early air samples. Nowadays these samples usually come from polar deposits. Although these samples are precious few and hard to define a particular year, they still help scientists study greenhouse gas concentration changes for the past 200 years. Modern advanced techniques also helped discover atmosphere component like hydro fluorocarbon, which were not paid attention to before. Reversal Strategy is one answer to multiple emerging global questions. A single synchronic action can reverse the collapse of human habitat to a better scenario. Simultaneous events seem to occour in the next decades. After the official statement of global warming (UN), the evidence of climate changes has dramatically actualized all the previsions about the increase of planet temperature. The question now is about the possibility to avoid the “non return date”. The politicians negotiation is all about emission reductions, but the only possible strategy nowadays is to reverse the trend of global greenhouse effect. Meanwhile time is giving to human civilization another deadline: the decomposing process of Carbonation makes reinforced concrete structure unstable in 70/80 years. Almost 60% of global concrete structure buildings was built in the 20 years after WW2. This means that in the next decades an impressive number of heavy and expensive structural refurbishments or reconstructions must occour. The collapsing risk of most concrete cities is increasing year by year. It is necessary to think new durable construction systems to reverse the collapsing trend and to substitute existing exhausted buildings. It is important to find a “new construction land” to build before moving people and functions. Then is possible to demolish what substituted. Urban areas figures demonstrate an increasing expansion of soil sealing and land consuming despite agricolture and wood. Private closed spaces are way much more determinating the urban grow while percentage of pubblic open spaces is decreasing. The consequence of this tendence on environment and landscape is known. Planet earth deserve a reversal strategy to change proportion between “closed land” and “open land”. How to “substitute” a massive amount of buildings with new ones without urbanizing open land? A possible answer is to build on the top of urban mobility network. Narrow structures can rise on the side of roads, just on the edge of urban blocks. These structural walls will became “the new construction land” leaving vehicles circulating at ground floor. Then infinite combinations of shells units can be hanged to the main structure. At this point local inhabitants can move to their new accommodation facilities, leaving old ones free to be safely demolished on places. Ruins will rise up ground floor level while roads and parking will became underground. Former blocks areas freed of constructions, will create a continuous sequence of pubblic open spaces, parks, squares, or even cultivated land, exclusively for pedestrian. Cities figure ground diagram is now completely reverted: old blocks are public open space, old streets are covered with buildings. A photo-catalyst based on copper oxide or other molecular catalyzer, will make possible, in a few years, the production of an Artificial Photosynthesis Leaf. The process, already prototyped, uses solar light, CO2, H2O to produce Hydrogen, Carbon, and Oxygen. This would not only remove carbon dioxide from the environment, but also turn it into solid carbonates that could be used for building construction. At the same time water splitting process will produce Hydrogen for all energy needs through Fuel Cells technology. In the past few decades the world economy has seen a global shift of industry and manufacturing eastwards to the emerging markets of China and India purely for economic efficiency but not innovation. The rate at which urban populations are expanding will impact upon how we perceive the strategies of sustaining our cities with regards to supply and demand. The rise of global cargo shipping has seen the ability of local industries to move their production to areas of low labour, tax and land costs. However, the onset of rising labour costs in East Asia, higher transportation costs, a weaker dollar, rising U.S. productivity and cheaper energy are only enhancing the argument for more localised production that is closer to the consumer. The population of New York City is forecast to grow by 12% to 9.4 million people in the next two decades resulting in a current city-wide acute affordable housing shortage. Manufacturing land in the city is perceived by planners as a viable outlet for the expansion of residential development, forcing a gradual decentralisation and extinction of local industries which are inherent to a wider network of urban ecologies within New York. In addition to a declining manufacturing sector, not aided by recent re-zonings or passive policy measures, the pressure on manufacturers to relocate in the face of development-led socio-spatial conflicts will only grow exponentially with a burgeoning population and an ever increasing reliance on imports. Economically diverse cities such as New York, with a substantial inventory of old, functionally unsuitable factory structures have the capacity to look at the new innovative and flexible industrial methods to revive manufacturing locally and regionally. However, the assumption that the city’s manufacturers are a dying breed or an anachronism epitomises the enormous challenge that the sector faces. 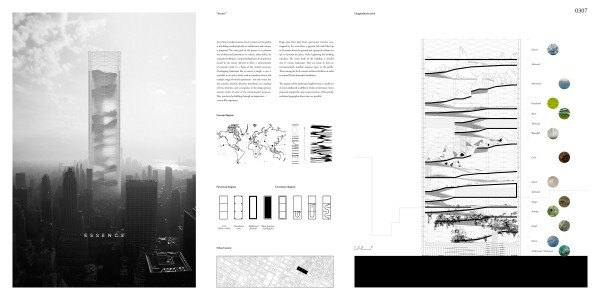 This project investigates the possibility of an alternative to inefficient horizontal industrial sprawl by considering the prospect of a new vertiginous architectural typology in the form of a vertical factory devoted to the stabilisation and re-integration of manufacturing into inner city Brooklyn. These interventions aim to act as a compromise to residential development aspirations and the shortage of suitable industrial land. 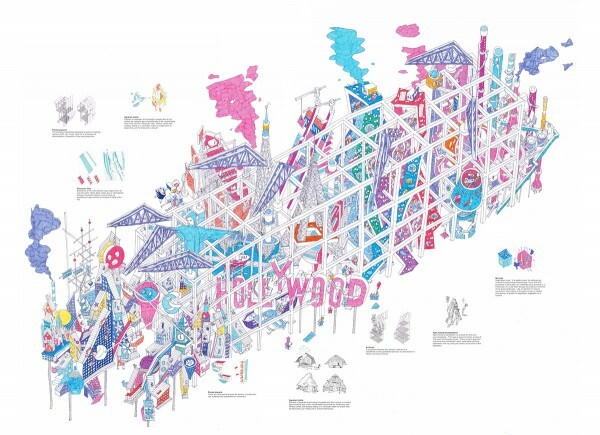 The new typological approach speculates the re-establishment of the once prominent manufacturing economy in the face of malign policy neglect and the City’s focus to sustain New York’s economy primarily through finance, insurance and real-estate initiatives. With the increasing demand of energy resources and the exhaustion of inland petroleum, the exploitation of marine seems inevitable. The drastic development of offshore rigs, however, comes with the great potential risk of oil spill, which will endanger the whole marine ecosystem tremendously for decades. The clean up of the spill, however, is still inefficient and time-consuming. Our design transforms the original rigs into vertical bio-habitats, which aims to exert instant response to oil spill, restore damaged eco-system and offer all beings shelter from future disasters. The original rig will become a reactor center, where the spilled oil will be converted into catalyst and building materials, as well as a recreational center and research facility. The structure underwater will be attached to pipes with a floater at the end. Our strategy could be divided into the following three periods of time. When an oil spill incident happens, the floaters at the end of each pipe will immediately absorb the spilled oil covering the surface of the sea as an instant response. 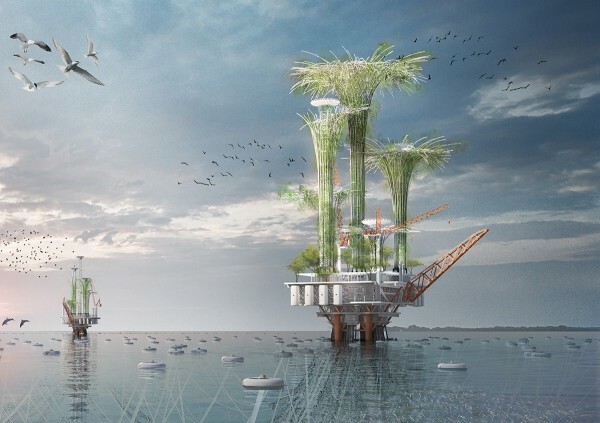 The collected oil will be transported through the root-like pipes underwater to the central processor attached to the original rig, where the crude oil will be converted into catalyst for coral reef and produce plastic as building material. The catalyst will be transported back to the pipe to booster the growth of coral reef on its surface and the plastic will become the building material of the plastic-twig structure with the help of 3d printing and the injector. 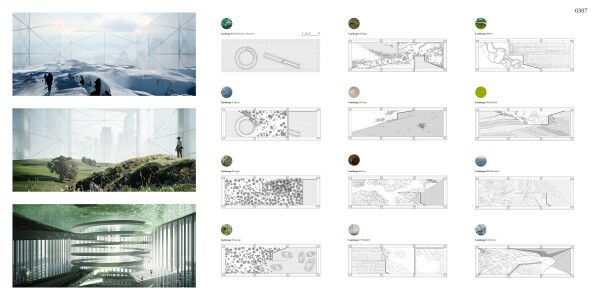 In this way, the project will become a habitat for vertical bio-habitat and help revive the biodiversity.